The Alamo Liaison Squadron would like to invite everyone to attend the annual Bluebonnet Picnic and Fly-in on April 25, 2009. The Alamo Liaison Squadron is a 501(C)3 non-profit flying museum that is dedicated to preserving the WWII liaison aircraft and preserving the history of those who flew them. Most of our funding comes from our members, but we enjoy the opportunity to educate the public about these aircraft and the men who flew them in perilous times. The event is our primary fundraiser for the year and will feature as usual good food, flying contests, history, and fellowship. All are welcome, and we extend a special invitation to "L-bird" pilots and friends. The event is family friendly and provides an up-close, hands-on look at the machines used by our heroic forefathers. The event is held at Cannon Field, a grass strip on the south side of San Antonio in a lovely rural setting. The identifier for the field is 53TX. In case of rain we will reschedule for May 2nd. For more information, directions, and contact information please visit our website. How come I don't see an L-5 in that shot? 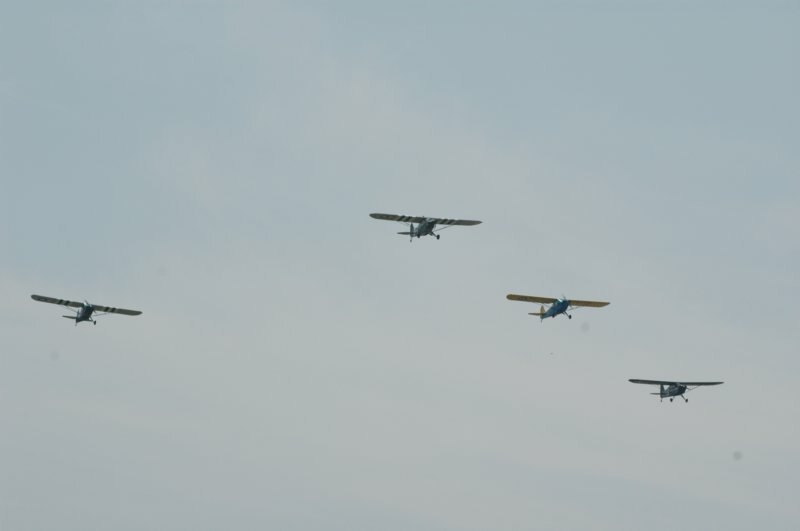 The guys doing the formation flying weren't using the L-5. That mix of aircraft does a little bit better. The L-5 has to go a bit slower to let some of the other birds keep up. Well, things are shaping up so far! We've been doing some formation practice and spent Saturday cleaning up the field and working on final plans. If you're in the San Antonio area, come on out and join us. Amazingly enough, while it's harder and harder to find WWII vets who are up to coming to events like this, it looks as though we'll have two or three L-bird pilots from WWII coming out - including one fellow traveling all the way from Utah with family, so this will be a "don't" miss event if you're into Lbirds. Rain date is May 6th, but we're having the barbeque catered - so if I don't post anything here, we're on.